We have grown to love Maestro Classics over the last few years. Our newest one is The Nutcracker and as soon as it arrived in our mailbox Alaina had it and in the CD player. Maestro Classics started in 2004 as Magic Maestro Music. Stephen Simon and Bonnie Ward Simon had sold-out concerts for young people for over a decade when they decided to share their gifts to a wider audience. They offer twelve performances by the London Philharmonic Orchestra. Maestro Classics want people both young and old to expand their listening experiences and create a new musical memory. We now own five titles from Maestro Classics; The Nutcracker, Mike Mulligan, The Sorcerer's Apprentice, The Story of Swan Lake, and Peter and the Wolf and we love them all. My girls, especially Alaina listens to them often. She has listened to The Nutcracker at least six times in the last two weeks. She also has a wish list and the ones she wants to listen to next are Merry Pranks of Master Till and Juanita the Spanish Lobster. The Nutcracker CD last almost an hour. 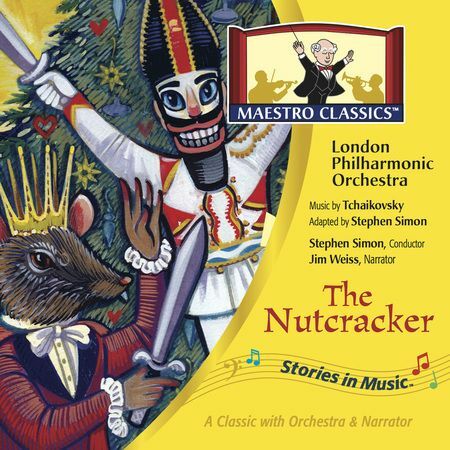 This is Stephen Simon's adaption of The Nutcracker, and he includes music from every section of Tchaikovsky's great ballet. It is preformed by the London Philharmonic Orchestra. While the orchestra plays the music the storyteller, Jim Weiss, tells us the story of Clara and how she was given a nutcracker on Christmas Eve and how it comes to life and becomes a handsome prince. The prince overtakes the Mouse King to take Clara to the land of the Sugar Plum Fairy. Clara isn't sure if this is just a dream. The CD comes with a beautifully illustrated 23 page children's musical activity book. It contains information about the history of ballet, the harp, and a small biography of Pyotr Ilych Tchaikovsky. A couple of puzzles, simple music of Overture to The Nutcracker and also information about Stephen Simon, and Jim Weiss. There are now free curriculum guides to go with the Maestro Classics CDs and they contain a lot of information. The Nutcracker Curriculum Guide contains information on the ballet, history & geography, science, language arts, art music, and math. We were introduced to stretching, ballet moves, nutrition, coloring pages, video links, passports for the kids, mini unit studies about Christmas & Tchaikovsky, and we are getting ready to learn how nutcrackers work and how they are made. The music on The Nutcracker is very well done, our whole family enjoyed listening to it. My adult son has been home for a month and the girls had him listen to it while they quietly played games and he really like it too. Jim Weiss has an excellent voice to be the storyteller, we could listen to him tell stories all day. A Hobby Lobby just opened in our town this month. As soon as we finished listening to The Nutcracker Alaina wanted to make a special trip there to take a closer look at the nutcrackers. Can you guess what is on her Christmas list now?